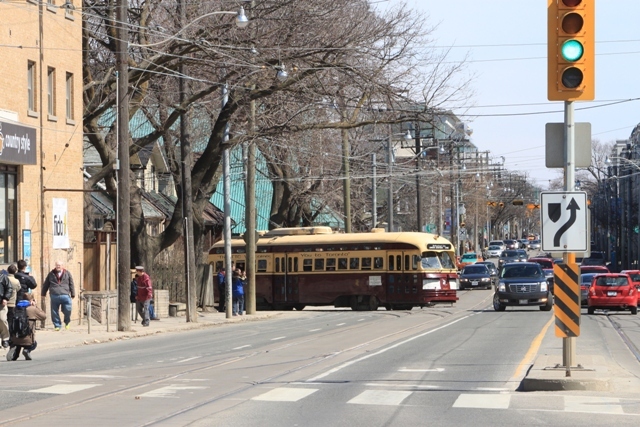 Streetcars will return to 511 Bathurst. The 502 Downtowner bus will continue to operate, but only during peak periods (Bingham Loop to Queen & University). The 503 Kingston Road car, normally a peak only tripper, will operate Monday to Friday peaks and midday (similar to the existing 502). The 503 car will run between Bingham Loop and Charlotte Loop (King & Spadina) to supplement service on King Street. The 505 Dundas and 506 Carlton routes will be converted to bus operation. Updated: The 514 Cherry service will be improved during the off-peak period. Buses that have been freed up from construction service and the route reorganization following opening of the Vaughan subway extension. Both Dundas and Carlton will be affected by planned construction projects this year that would require partial replacement with buses even if there were no streetcar shortage. Broadview Avenue track replacement from south of Dundas to Wolfrey (north end of Riverdale Park) including intersections at Dundas and Gerrard. This will also affect the east end of 504 King. The TTC has confirmed that they are reviewing stops on both routes for the need to remove adjacent parking spaces that would prevent vehicles from pulling in fully to the curb. Bus operation will use the same POP rules as on the streetcar routes. At the TTC Board meeting on January 18, Acting CEO Rick Leary stated that although the bus conversion of 505/506 was originally announced for all of 2018, he hopes that with delivery of new streetcars this can be reversed sometime in the fall. Roncesvalles Carhouse will close for the remainder of 2018 for maintenance work, and operations will be centralized at Russell and Leslie. 501 Queen service to Humber Loop is planned to return with the schedule changes planned for May 13, 2018. The King-Queen-Roncesvalles intersection replacement, the associated road reconfiguration and the extension of the right-of-way east from Parkside Drive to Roncesvalles remains in the 2019 schedule. Even if buses were not filling in for streetcars, the TTC has no plans for bus service increases. More information is expected at the TTC Board Meeting on January 18, 2018. Also, the detailed memo of service changes for February should be out soon, and I will publish the usual condensed version when it is available. Thanks to Stuart Green at the TTC for the information. Because the options for the Waterfront West line are not fully explained or explored in the City report, I have added the drawings of the options from the Environmental Assessment to the end of this article. A few weeks ago, I reported on a presentation at the TTC Board meeting by Deputy City Manager John Livey on the status of various rapid transit plans and studies. This was by way of a preview of reports that were expected at the City’s Executive Committee meeting on October 20, 2015. The new report proposes a “reset” in the status of the many waterfront studies and proposals given that many of them are incomplete or out of date. The area of study will be south of Queensway/Queen from Long Branch to Woodbine, although there is passing mention of Scarborough which has its own collection of transit problems in the Kingston Road corridor. The fundamental problem along the waterfront and areas immediately to the north is that population and plans for development continue with no end in sight, while transit planning, such as it exists at all, looked much further afield for signature projects. Moreover, origins and destinations in the present and future waterfront are not conveniently located along a single line where one scheme will magically solve every problem. Transit “downtown” is not simply a matter of getting to King and Bay. There is a mix of short haul and long haul trips, and a line designed to serve the first group well almost certainly will not attract riders from the second. Better transit on King and Queen, whatever form it might be, will address demand from redevelopment of the “old” city north of the rail corridor, but it cannot touch the “new” city south to the lake. Service on the rail corridors (Lake Shore and Weston) can address some longer trips, but with constraints on both line capacity and service frequency. Despite politically-motivated claims, the GO corridors will not be “surface subways” with service like the Bloor-Danforth line, and GO service is constrained to operate through some areas that are not well placed relative to the local transit system. 502 Downtowner (formerly Kingston Road) operates between Bingham Loop (at Victoria Park & Kingston Road) and McCaul Loop sharing trackage with 501 Queen west of Woodbine Loop (which is actually at Kingston Road, and is named for the old racetrack, which itself became “Greenwood” when “New Woodbine” opened in northern Etobicoke). This route operates weekdays until the end of the PM peak. Evening and weekend service is provided by the 22a Coxwell bus. 503 Kingston Road Tripper operates rush hours only between Bingham Loop and York Street running into the core via King from the Don Bridge, and looping downtown via Church, Wellington and York. 1954: Streetcar service cut back from Birchmount Loop to Bingham Loop. 1966: Coxwell bus replaced Coxwell streetcar and evening/weekend service on Kingston Rd./Coxwell (same as the 22A today). The route name “Downtowner” arose from an ill-advised proposal to provide “relief” to the downtown subway by extending Kingston Road cars from McCaul Loop west and north to Bathurst Station in 1973. This didn’t last long. A year later the extended service became a peak-only operation, and that remained, on paper at least, until 1984. We have the name as a memento of that extension now 30-years in the past. The basic problem was that very little of the service actually reached Bathurst Station with many cars short turning either at Wolseley Loop (Queen & Bathurst) or at McCaul Loop. A short turn eastbound at Woodbine Loop removes service from the street which the route is intended to serve. A short turn westbound at Church (looping via Richmond and Victoria) sends a car east without serving the major stops downtown from Yonge to University. A short turn westbound at Parliament (looping via Dundas and Broadview) removes a car even more from downtown, and not even a clever rider walking a block east from Yonge (an “illegal” move with a regular transfer) can take advantage of the service. This is compounded by extremely erratic headways that are far worse than I have seen on any other route I have analyzed. According to TTC route performance stats, the 502 is “on time” (that is to say, within ±3 minutes of the scheduled headway) 30% of the time. As we will see later, even that claim is a stretch. As for the 503 Kingston Road Tripper, service on that route is supposed to be blended with the 502, and during AM peaks it can work out, sort of, there is a vaguely reliable headway of alternating 502/503 cars on Kingston Road. But it’s a hit-and-miss situation, and very large gaps in 503 service are quite common. Anyone attempting to use transit on or to Kingston Road is well advised to get on the first thing that shows up and be prepared to transfer. This appalling situation is a mockery of what the TTC claims is its “customer service”. Service on Kingston Road was substantially better in past decades, and it is no wonder that ridership and scheduled service levels have fallen given the unpredictable nature of these routes. Recently, there has been some improvement. In April 2013, off-peak headways of 502 Downtowner improved from 20 to 16 minutes, and in June 2015, from 16 to 10 minutes. However, the fundamental problem of headway reliability undoes much semblance of “improvement”. Most of the changes for the July-August schedule period are triggered by construction projects. The detailed list linked from this report now includes a chart showing the expected duration of all projects in progress. The 172 Cherry bus is affected both by the seasonal service to Cherry Beach and by an extension to improve the connection with 72 Pape. The Cherry buses will now operate east on Commissioners to Carlaw looping via north on Logan, east on Lake Shore and south on Carlaw. The Cherry bus has also been operating over its “standard” route via Mill and Cherry Streets through the Distillery District since June 21, although this route is occasionally blocked by parked cars that still behave as if the roads are closed and have no transit service. Recently, the westbound service changed back to the diversion via Lake Shore and Parliament because Metrolinx construction at the rail corridor makes bi-directional operation through the Cherry Street underpass difficult. Water main construction was planned for Broadview from Danforth northward, but this project was cancelled after the schedule changes for July-August were already in place. Bus routes operating from Broadview Station will have slightly widened headways to allow for construction delays, and streetcar service will be replaced with buses on Broadview. 504 King cars will loop via Parliament, Dundas, Broadview and Queen. 505 Dundas cars will loop via Parliament, Gerrard, Broadview and Dundas. 504/505 Shuttle buses will loop via Queen, River and Dundas. A concurrent project at Spadina & Dundas (described in another post) requires all 505 Dundas cars to divert both ways via McCaul, College and Bathurst. No additional running time has been provided in the schedule to accommodate this. Construction work at Roncesvalles Carhouse requires the reassignment of some peak period runs to Russell Carhouse. On 512 St. Clair, cars will be stored at Exhibition Loop overnight, and service during some periods will be improved so that this storage is only required between 10pm and 10am. A 791 Roncesvalles Operator Shuttle will ferry operators to and from Exhibition Loop. Articulated buses will be operated on the peak period express services on 53 Steeles East. Currently, one in three express trips operates east to Staines Road, but this will change to one in two trips. The combined service on the express branches will change from 4’45” to 6’00” in the AM peak, and from 5′ to 7′ in the PM peak. The local service to Markham Road does not change. The May 2014 schedules will bring major changes across the system mainly in response to construction projects. Extra running time will be provided on many routes in response to construction delays. At some times, the current headway will be maintained, while at others the headway will be stretched. In two cases (46 Martin Grove and 94 Wellesley), no buses are available to improve PM peak service to compensate for extra running time. The budget for construction-related service is considerably less than what will actually be required. Although the total hours operated will be greater than the budget for May, “regular” service will be below budget while “construction” more than compensates. Some changes in the fleet and in service levels have been deferred until later in 2014. This table is broken into four sections listing miscellaneous minor changes, construction-related changes, one route restructuring and seasonal changes. Effective Tuesday, May 20, the diversions for the Queen & Victoria track project will be changed. All westbound 501 Queen cars will divert via Church-King-York. 501/502/503 shuttle bus services will terminate at Church Street. The details are on the TTC service advisory page (scroll down to see the portion effective May 20). Updated February 11, 2014 at 10:00 am: Questions & answers related to trackwork plans and new streetcars have been added. Due to the delays in Waterfront Toronto’s work and the need for TTC work to follow in series (i.e. overhead), it is not anticipated that the loop will be available for service for the May Board Period. Once we have greater clarity, we will reflect that online. Some preliminary work on suspension for the new overhead has already been done, but this cannot be completed until the track is in and overhead vans can drive on the new pavement at the loop. As plans now stand, service will resume on both the 510 Spadina and 509 Harbourfront routes with the re-opening of new streetcar track on Queens Quay rather than in two stages as originally hoped. I await detailed info from Waterfront Toronto on updates to their construction plans. Much of the utility work on the south side of Queens Quay is now completed, and traffic is shifting to that side of the road at least as far west as Rees Street. This move will allow work to begin on the new streetcar right-of-way in the middle of Queens Quay and the construction of the new permanent roadway on the north side. Detailed construction news updated weekly is available on Waterfront Toronto’s Queens Quay project page. No sooner will streetcar service resume on southern Spadina, but the route will convert to bus operation for two track projects likely in August. The intersection at Dundas will be rebuilt this year (the one at College has been deferred because of scheduling conflicts), and there will also be work at Spadina Station. When the line reopens on August 31, service will be provided, at least in part, by the new low-floor streetcars. Q: What work is planned at Spadina Station? Track? Platform – especially provision so that two new cars can be on the platform at once – one loading, one unloading. Only 3 CLRVs fit there today. A: The TTC has placed two low floor streetcars at Spadina already. They can physically fit inside the station, although the lead module of the lead car would have to be positioned opposite the five pillars with glass curtains, and that the lead door would be on curved track with a wider gap between the vehicle and the platform. We are reviewing operating procedures and possible alterations that are necessary to allow two new cars to be on the platform at the same time if necessary. This implies that the work to be done in August will be trackwork, not platform changes. Q: What is the status of the order and when will production deliveries begin? A: Production deliveries will begin in March. Q: What will be the rate of deliveries? A: As always planned, there will be a ramp up to the production rate of 3 per month (36 per year). Once stabilized at this rate there are opportunities to transition to a higher rate and this is currently under investigation. Q: What effect will this have on planned retirement of the problem ALRVs before the next winter season? A: ALRVs will begin retirement at the end of this year and throughout 2015 as more new streetcars enter service. What is still unclear is how the TTC will adjust service on 504 King and 501 Queen as the ALRVs [the existing two-section streetcars] disappear from the fleet and these routes continue operation with the remaining CLRVs [the shorter, single-section cars]. Q: Are there outstanding issues still to be dealt with on the ramps in the new streetcars, or have whatever design tweaks were necessary been incorporated in the production versions we will receive? A: There are still a number of outstanding issues to be resolved. The production vehicle will have the necessary structural changes made to receive the new ramps. However, there is a transition phase between cars going into revenue service and when the final version of the ramp is delivered. For a number of vehicles that will go into service, an interim ramp will be incorporated to improve on accessibility – with improved transition between the ramp, the door threshold and the interior car floor. The final production version will be lighter in weight, less demanding on the drive mechanism (hence more reliable), and will have faster deployment and retrieval times. Initial production cars that do not have the latest ramp configuration will be retrofitted with the final version as part of the configuration control process. Among the City-imposed cuts in the Capital Budget was a $10-million/year cut in surface track maintenance for 2014 to 2018 with an equal cut to subway track in 2019 to 2023. I asked about the effect of these cuts. State of good repair, which track replacement is clearly part of, will not be affected. If we need to further cut the capital budget to do track work, we’ll find that money elsewhere. Two major projects will affect streetcar service on Queen Street East this spring. At Queen and Leslie, the new sewer line must be tied into existing infrastructure under Queen Street, and then the new special work for the track leading to Leslie Barns must be installed. Tentative plans are for this work to begin in mid-May and run to the end of June. A 501 Queen bus will run from McCaul Loop to Woodbine Loop (at Kingston Road) diverting around construction via Jones, Dundas and Greenwood. 501 Queen, 502 Downtowner and 503 Kingston Road Tripper streetcars will divert via Broadview, Gerrard and Coxwell. Carhouse trips for 504 King and 505 Dundas that now operate west from Russell Carhouse via Queen will use Coxwell and Gerrard. Beginning at the end of June and running through July, the special work at Broadview and Queen will be replaced. This intersection is in poor condition with long-standing slow orders and one switch (west to north) permanently out of service due to a danger of derailments. The 501 Queen bus will divert via River, Dundas and Carlaw. 501 Queen, 502 Downtowner and 503 Kingston Road Tripper streetcars will divert via Parliament, Gerrard and Coxwell. 504 King cars will divert via Parliament and Dundas. Carhouse trips to Russell will continue to operate via Coxwell. Normal service on all routes resumes in August. Q: The 504 King diversion around construction at the Don Bridge is now listed as running to August due to additional work in the area. I understand that the track connection at Sumach to the new Cherry Street line is to go in this year. Will this be done while the 504 is on diversion (ie before August), or will there be yet another shutdown for this trackwork too? A: The Sumach/King connection work is scheduled for March 30. Q: With the extended period of various diversions, why has there been no change to implement transit priority or at least advance greens for left turns at various locations? A: We continue to work with the City on transit priority signalling. There are no new installations to date; where there, they are in use. Advance greens and the like is a question better put to the City. I am meeting with Stephen Buckley, Toronto’s General Manager of Transportation Services, on February 12 and will discuss this issue with him.